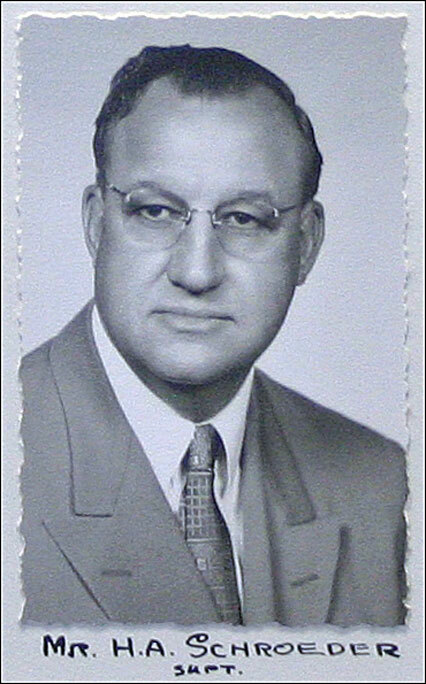 After graduating from Wayne, his career in education took him to Scribner, where he was Superintendent for 11 years. Then it was on to Broken Bow for four years; but then he left education to manage a Broken Bow hotel. In 1946, Schroeder and his wife, Opal, came to Chadron, where he had been hired as manager of the Blaine Hotel; however, he was soon recruited to replace the late James Skinkle as Superintendent of Schools. Henry “Heinie” Schroeder served as School Superintendent from 1947 until 1967. While a few students over those years got to see the inside of Heinie’s office and experience “character-building” spankings, most knew him as a gregarious and fairly jovial fellow, who – with little prompting – was happy to demonstrate his football skills by punting a ball to the top of the school building. Opal Schroeder taught Kindergarten at East Ward for some 20 years. Their daughter, Susan (Schroeder) Lundberg, was a 1955 graduate of Chadron High School. Upon retirement, Heinie worked at the Pine Ridge Job Corps Center for a few years. Chadron historian/writer Con Marshall says Heinie played a key role in getting accreditation for the school at the Job Corps Center, which is nestled atop a hill south of Chadron in the Nebraska National Forest. It wasn’t long, however, before the Schroeders decided to head back to their roots in eastern Nebraska, spending their remaining years in Norfolk. Heinie Schroeder died in 1983; Opal passed away in 1990.